Endings often lead to beautiful beginnings. 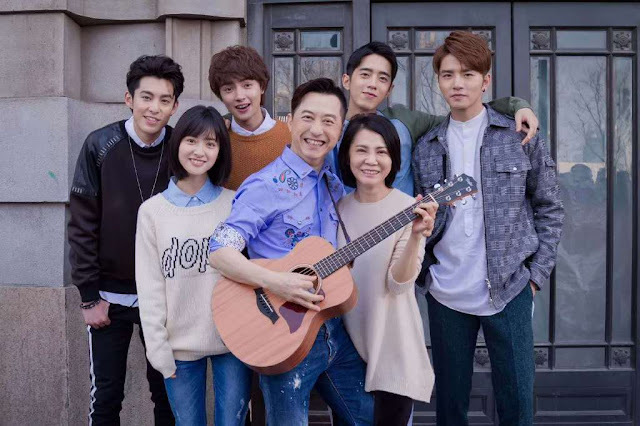 As much as I'm sad for Meteor Garden to end so soon, I'm happy that the characters are really fulfilled as they set out for a new chapter of their lives. From our newly-wed couple to the dating couples, their cute teasing moments will surely keep us nostalgic again for years to come. Pranked. Shan Cai calls Ximen to ask where everyone went as she thought that they were supposed to do a send off for Lei. Ximen tells her that she missed it and that Lei is already in London with Dao Mingsi. Shan Can finds it impossible that Dao Mingsi would leave her behind, but Ximen shrugs it off by saying that she and Dao Mingsi aren't back together anyway. Shan Cai panics and is about to run to the airport to clear things up when she bumps into Dao Mingsi's butler and faints. Deja Vu. Shan Cai wakes up in a wedding gown and the first person she sees is Dao Mingsi. He tells her again what he told her before, "I can make you my woman if you will listen to me." Shan Cai gets really mad so she picks up her shoe to throw it at Dao Mingsi. It's just like back in the old times when he was courting her haha. This time, Dao Mingsi leaves and Shan Cai pleads for him to stay. You're still my one and only. Dao Mingsi's sister suddenly appears out of nowhere and starts dancing. Upon the request of Shan Cai, she chants something like a magic spell to summon Dao Mingsi but something goes wrong and it's the F3 that appear instead. She tells Shan Cai to just choose one guy from the F3. Wait, what? The three boys try their best to ask for Shan Cai's hand but she rejects them one by one, telling them that her heart is only reserved for Dao Mingsi forever. That's just so sweet. A fairytale wedding. Lights go off for a second and in a flash, Dao Mingsi is back holding a bouquet of flowers to make a formal proposal to Shan Cai! What's better is that all their friends are around to support them. Dao Mingzhuang suddenly fly kicks Dao Mingsi from the back and tells him to stop stalling and marry Shan Cai that instant. What's the rush, it's not as if Shan Cai will still run away. She officiates the wedding and pronounces them husband and wife. It seems that their parents are not around though? A mother's love. In the next scene, the newly weds are back in the city of Shanghai. They wake up to the smell of something burning and they see Dao Mingfeng struggling to cook breakfast for them. Dao Mingfeng wants to at least cook a meal for her son and daughter-in-law before she leaves for a tour around the world. I guess that's not happening anymore since all they have are burnt toasts. It's so nice of his mom though and so unlike the Dao Mingfeng that we've come to know. A bittersweet ending. Aside from all the product placement in the last episode that proved distracting, it's really sad to say goodbye to each of the characters as Meteor Rain played in the background. Dao Mingsi, Shan Cai, and Lei are in London, Meizuo and Ximen are in Shanghai, Zhou Caina and Terris are in their treehouse, Li Zhen, Qinghe and Jing are gazing up the same night sky, watching the meteor shower. The last episode also features a new potential love team when Xiaozi's scarf gets tangled with Thomas' bag! They probably should have met earlier though. I actually thought that the story would end there but it didn't because of course, the ending wouldn't be complete without everyone. Producer Angie Chai and singer Harlem Yu join in the last scene to sing Qing Fei De Yi with the F4 and Shan Cai. It's great to end on a joyous note, though I really felt that the episode was rushed to make space for this last one. Maybe they shouldn't have spent more that a couple of minutes for this and just added more minutes to the wedding preparations. Despite that, I would still want to say kudos to the team of Meteor Garden 2018 for bringing such an amazing drama to our screens! Thank you for taking the time to write the recaps. Didn't watch this version but I've been dipping into your recaps. Finally a wedding in a Boys Over FLowers adaptation. The Hana Yori Dango wedding was gorgeous but it didn't happen until the movie. Why are they sitting in a ball pit in the main picture? Random concept lol! Thanks for all the recaps! One of the Best Dao Ming Si! It was great to see Dao Ming Si and Shan Cai have their happily ever after! And can i say that Shan Cai's parents are soon much more likeable in this adaptation! Especially the part where DMS stayed for the night and bunked in the same room as Shan Cai's Dad...when Shan Cai's Dad was entrusting his daughter to DMS...so touching! So, the parents (especially Shancai's parents) not being present really annoyed me and I still can't let that go. Like what happened? Xiaozi and Thomas should have met at the wedding. Both of them even talked. I wish may part 2 kasi for me nakakabitin yung happy moments nila nkakabitin tlga . Does anyone know the instrumental soundtrack playing at the background when Shancai is in the wedding dress? It sounds so familiar but I've been searching for it for nearly a month and couldn't find anything. I need help with that ending, because something wasn't explained, after Shancai fainted what happened, watching the last episode felt like i was watching a dream.